the role of the acoustic scale information in the perception of source size and instrument register. Vowel spectra illustrating the two forms of size information in communication sounds - glottal pulse rate and vocal tract length. The description of Auditory Processing is based on the Auditory Image Model (AIM) of hearing (Patterson et al., 1995). There are computational versions of AIM written in Matlab and C. They are referred to as AIM-MAT and AIM-C, and they can be obtained from the SoundSoftware repository. There is tutorial that describes the stages of auditory processing simulated by AIM. It was written for the original Matlab version of AIM referred to as AIM2006, but it still provides a good introduction to computational audition. The Auditory Processing section of the wiki provides an explanation of what is meant by the terms auditory image, auditory figure, auditory event, auditory scene and auditory object. It includes videos that illustrate how the auditory system separates the temporal fine structure in a sound (which we hear as pitch and timbre), from the temporal envelope (which we hear as the dynamics of auditory events). 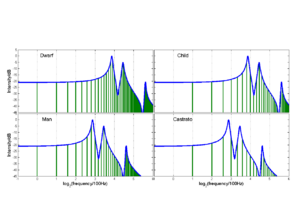 The Auditory Perception section of the wiki presents research papers and projects which describe the role of acoustic scale and the auditory image in auditory perception. The wiki is intended to be a repository for information on acoustic scale and auditory size, but it is not intended as a discussion forum like the traditional wiki. If you have relevant information that you think should be added to the wiki, please send it to in wiki format and if we think is fits with what is already here, we will add a page for you with the appropriate credits. This page was last modified on 13 May 2014, at 16:39. This page has been accessed 365,480 times.